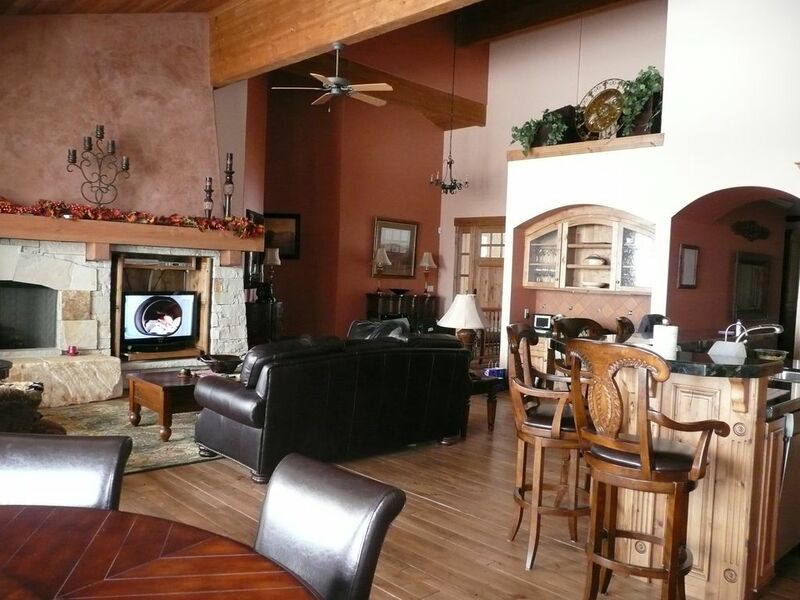 Winter or summer in Park City 5 bedroom luxury home rental is everything you could want in a mountain get away. If you're interested in easy access to the ski slopes, enjoy undisturbed walks in the mountains and room to roam, a big hot tub outside your bedroom door, large beautiful swimming pool and tennis courts across the street this is the place. Steps from Park Meadows Golf Course, Jack Nicklaus designed course and Senior PGA Tour site. Community Swimming Pool and Tennis court. Easy to get to and near everything: Three major ski resorts; Deer Valley; Park City Mountain Resort; and The Canyons are all just 10-25 minutes away. The Salt Lake City International Airport is approximately 45 minutes and the main entrance to the Uinta Mountain Wilderness Area is a short 30 minute drive to the East. Skiing, snowboarding, snowmobiling, horse drawn sleigh rides, world class fly fishing, mountain biking, hiking, outdoor summer concerts, balloon rides and some of the best cuisine available anywhere are just a few of the pleasures awaiting you in our area. Hiking and Snow shoe, Cross Country Ski: The Last Sun at the Cove neighborhood is located above the Park Meadows section and is boardered by the 8,000 plus acers of the Round Valley hiking trails. The trails are used both summer and winter and are maintained by the city for cross country ski, mountain biking and hiking. Hello, I fell in love with Park City and my husband the winter of 1983. I have been coming here every year since and bringing the family and friends that I love with me. My husband was killed in a plane crash opening day of Sundance January 2003. I decided that this would be my second home and built this home to share with my family and friends. You will know the warmth of the home the minute you step through the doors. I travel all over and yet this is the place I choose to come back to both winter and summers. Enjoy! We love this property for the views, easy access to all of Deer Valley, Park City and the Junction. Walk out hiking trails, swimming pool and tennis. Quiet and peaceful yet in the heart of all activities. The rooms and design allows so much space for all so that even with 18 ADULTS an infant and toddler you have plenty of privacy. Old town downtown is just 8 minutes by car. Grocers just 5 minutes and multiple Restaurants, Movie theaters, stores within 5-10 minutes away. We are located on the Round Valley mountain and hiking trails. Giving you instant access to miles of groomed hiking trails just out your front door. The Canyons is 2.2 miles away to the North, Park City 1 mile in front and Deer Valley 2.2 miles to the South. Association has own beautiful pool and tennis courts on grounds. There is a community park in front of our home and thousands of Acers of open space for biking and hiking at Round Valley. 30 courses within an hours drive two within minutes drive one a short walk away. First floor now steps, entrance way has only two steps, entrance from garage no steps. A few steps to enter building . First floor ideal for wheel chair .. others not. Fantastic big home for your family reunion! We had five adult children, 3 spouses and 6 grandkids (2 were babies so we didn’t really count them,). Everyone had a bed! The gathering area was perfect for us to play games, watch TV, work on puzzles, and cook in the beautiful kitchen but stay close to the gang. We enjoyed walking to the community pool (it was cold!) The WiFi was terrible, but the owner knows what needs to be fixed now and will have it fixed soon. We drove down to the Fresh Market several times for groceries. We also found free parking lots for when we walked around in the city. We rented a ski boat one day and everyone loved it! The house is elegantly appointed and was like a 5-Star hotel. Don’t give up on the dryer, it really does work! And the pool key is on a key ring with other keys but is a bigger key than normal. All my kids would enjoy going back to the same house some day. The beds were SO COMFORTABLE and the air conditioning worked great! A lovely home for your family vacation. Spacious, well equipped and stylish! The house, set in a beautiful community, was perfect in every way for our 3 generation family of 10. It is spacious, attractive, and comfortable with a spectacular view of the slopes of Park City. We quickly learned a quick, easy back route to Deer Valley for skiing. Nearby are markets, shops, and the State Liquor Store. We included three children; a great aunt, grandparents and two couples in their late 30s. The five bedrooms were ample, and the boys loved the fact that there were two bunks in their room so each had an upper bunk. The street entry level has a master bedroom and bath, an open kitchen with island and counter, a dining space with a large round table, and a sitting area with gas fireplace as well as a large mud room and powder room. One flight down are 3 bedrooms with two full baths and a laundry room. The lower level has a bedroom, two full baths and another large sitting and game area, complete with pool table. Just outside is the hot tub. The garage easily held two full sized vehicles. The open, well stocked kitchen made prep for breakfasts and dinners a treat. The large gas range and oven are a cook’s delight. We particularly enjoyed using the waffle iron in the mornings. With young children, tired after a day of skiing, and some seniors in the same state, we enjoyed most of our meals at the house. Perhaps, most important, the owner of the house was gracious in providing all kinds of information about her property and giving us contacts in the event of questions. She also had numerous suggestions of activities in the Park City area. We left looking forward to a return to Talon Way next year! We had a great stay at Sally's home. The moment we arrived, we could tell that this house would provide all we needed. If you run out of towels, there are an abundance of extras in the bathroom cabinets. If you want to cook there are pots, pans, flour, sugar...even a waffle maker! The home was warm and comfortable for our group of 11. The round dining room table allowed us to eat breakfasts and dinners together. It was wonderful unwinding in the hot tub at the end of the day. The house is large enough to spread out, but with a very cozy main floor where we could all gather together. The beds were comfortable and appreciated all the bathrooms. Sally provided us with a packet of instructions for everything from the wifi to the waffle maker. When we did notice anything (such as a wobbly chair), we called the maintenance number provided. He was so helpful and came right away. This house is in a perfect location. 10 min drive to the grocery, mountains, and town. We really loved walking around the neighborhood to see the other beautiful homes and there is a trail to hike within a few minute walk. As you can see, we were very happy with our stay here and highly recommend it . Three families with small children stayed here very comfortably. Plenty of room to spread out, have our own space, and plenty of room to be all together for meals and fun. The kids were enthralled by the size and three story layout. They played lots of hide and seek. Super clean. We loved sitting out on the decks in the morning for coffee. We used the hiking trails (trailhead literally at the front door) and the pool table was a big hit with kids and adults. Just wish we could have stayed longer! Golf: Park Meadows Golf Course is a block down the road. Behind the lodging is 8,000 acres of wilderness park to hike and enjoy. Large Swimming pool and tennis courts on the grounds for your pleasure. Ski: Three major ski resorts; Deer Valley; Park City Mountain Resort; and The Canyons are all just 10-25 minutes away. Five more major ski areas including Snow Bird, Alta and Snow Basin are within an hours drive from this location.